SHANGHAI (Reuters) - China's birth rate in several regions, including the capital Beijing, fell again in 2018, the official China Daily said on Friday, despite government efforts to encourage couples to have more children. Alarmed by the rapid ageing of its population, China relaxed its controversial "one-child policy" in 2016, allowing all couples to have two children instead of just one. The change has failed to reverse what demographers say is a long-term trend of falling birth rates fuelled by growing prosperity and concerns about the high cost of raising children. 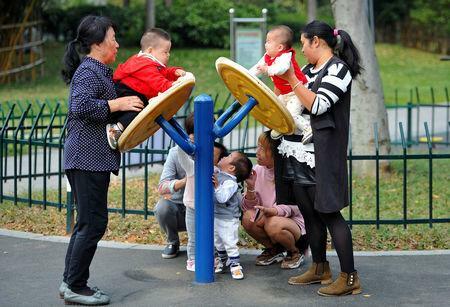 Beijing's birth rate fell to 8.24 per 1,000 people in 2018 compared to 9.06 in the previous year, China Daily said, citing figures from local authorities. In the financial capital Shanghai, the birth rate dropped to 7.2 per 1,000, from 8.1 in 2017. Beijing's total population fell for a second straight year in 2018, dropping 170,000 to 21.54 million people, though the decline could also be due to new policies aimed at shifting "non-capital functions" out of the city, China Daily said. The birth rate in Liaoning, a rustbelt province where the population has dropped in recent years due to an exodus of young people, fell to 6.39 per 1,000, from 6.49 in 2017. China recorded 15.23 million births last year, down 2 million from 2017 and the second consecutive annual decline, according to the National Bureau of Statistics (NBS). Marriage rates are also falling throughout China, with the ratio of newly-registered marriages in the total population down to 0.72 percent last year from 0.99 percent in 2013, NBS data showed. China's ageing problem was on the minds of delegates to the annual session of parliament this month, where some called for radical new measures to encourage new births. Think tanks expect China's population to peak at 1.4 billion in 2029 and then begin an "unstoppable" decline that could reduce the workforce by as many as 200 million people by the middle of the century. By 2050, China's dwindling number of workers will be under pressure to support more than 400 million people aged 60 or over, putting the country's pension, health and social service provisions under immense strain, experts say.